Here is this week’s hunt. My neighbor’s dog Lucy. I used artificial light (flash) and this is SOOC. This entry was posted in Scavenger Hunt and tagged photography, scavenger hunt sunday. Bookmark the permalink. Follow any comments here with the RSS feed for this post. Comments are closed, but you can leave a trackback: Trackback URL. Haha…I saw your photo for “artificial” and was thinking that CAN’T be a “fake” dog! So glad I read your explanation. Love that horse shot. The crop is fantastic. Oh no, she is real all right must be the only photo i ever took of her being still. I so rarely use flash, just not my thing. How about you and James Dean? All I can say is WOW. But the boy is the star of this show. Even in a box, he shines! The horse one took my breath away and the one of your son?? AMAZING. Leighann recently posted..My Gift to YOU!! Thank ou so much. You have some mad scrap booking skills my friend! 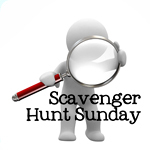 Saun recently posted..Scavenger Hunt Sunday! Your tractor picture reminds me of one of the tractors in the movie cars. I, too was thinking there was no way the dog could be fake as it looked to real! Super set of pictures. Oh My Lucy is so cute… Lovely entries this week, of course that young man smile is just too cute. Love your repeating patterns, great dof. Love the horse and your boy in a box with a smile. Love your take on artificial! Great rusty. Wonderful set all together! I’m really loving both the animal photos today. Wow, taken with a flash… and it looks so good! They do love boxes, don’t they? Amazing pics as usual. His smile is so cute! Love the snow on the fence – great finds! Loved them all!! Love that rusty truck. And pattern too! Of course, smile steals the show! Aren’t boxes the best toys?? It’s hard to pick a favorite, but I think I’ll pick the horse…I love your composition. But your son’s photo is adorable!!!! Isn’t it strange. I should just order boxes and bubble wrap from Amazon Were your kids the same? Yes, my kids played more with the boxes and kitchen utensils than they did the toys. It’s amazing how a spatula, big plastic spoon and empty yogurt container can keep them occupied for hours. Enjoy every minute with your little one. When you turn around, they are all grown up. I love the old Case tractor. Yeah I’m a farm girl. What a sweet smile! The repeating patterns is gorgeous, and the processing on that tractor is superb. So. I should never take another picture again. Pretty much. A boy in a box. It’s the simple things that make them happy! Sweet dog. Loved the horse, too. Ally recently posted..While I’m "De-Stressing"
LOVE Little J in his box…they make the best toys! Your pictures are always so peaceful, Stasha. Little J looks like he is getting big, too. I’m not just saying this – each week your photos get better and better. WOW! The golden retriever, the snow, the tractor – all of ‘em! FAB! Great set! I love all of them! Love love love that second one! These were great. Your boy looks so cute playing in the box. Loved your Stand Alone horse photo and the Rusty Tractor. What a beautiful dog, well done. (sigh) Your pictures are always so awesome. loving the rusty old tractor! Gorgeous pictures! My son also enjoys playing with boxes a lot more than his toys. Next lifetime I will save the money and let him play with the recycling. I love all your pictures but, the snow shot has left me wanting snow. These pics are great! I really love the last one. Very creative! Great set! I love the Little J smile… so he likes boxes? My little J does, too. All of these shots are wonderful, great composition! oh I LOVE the neverending story movies!!! great picks for the music list.. This might be your best set EVER! I love them all!